It’s a very special day— the first day of Passover! As surely as the leaves fall from the trees every autumn and the flowers bloom every spring, Bubbe will come and make her special matzo ball soup. The soup is so good, everyone sneaks into the kitchen to steal a taste and when suppertime comes, there aren’t enough matzo balls left for Bubbe. Where does Eleanor find a very special matzo ball for Bubbe? 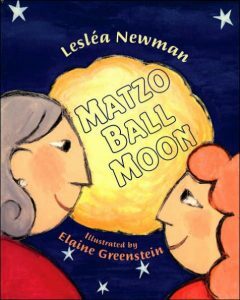 You’ll have to read Matzo Ball Moon to find out! A bowl of delicious matzo ball soup, made from my grandmother’s special recipe. Passover is my favorite holiday. When I was a child, my grandmother, Ruth Levin, would come to our house and cook all day to get ready for the special holiday meal. I wrote Matzo Ball Moon to pay tribute to my grandmother and her wonderful cooking. On the morning of Passover, Eleanor woke up bright and early and ran downstairs to the kitchen. Mama and Daddy were sitting at the table drinking their coffee. Mama put a bowl of cereal down at Eleanor’s place. “Is Bubbe going to make chicken soup with matzo balls?” Eleanor asked. “I hope so,” said Mama. “I hope so,” said Daddy. Eleanor lifted a spoonful of milk from her bowl and blew on it, pretending it was chicken soup, still too hot to eat. Then she took a bite of cereal and pretended it was a sweet, chewy matzo ball. Eleanor’s big brother, Joshua, raced into the kitchen, gulped down his orange juice and ran out to catch the school bus just the way he always did. “Don’t forget, Bubbe’s coming today,” Mama called after him. Then Daddy left for work, and Mama cleared the breakfast dishes. Eleanor waited and waited and waited. At last she heard the chug-chug-chug of Bubbe’s car pulling into the driveway. Bubbe thrust her hands on her hips and pretended to be insulted. “Do the leaves tumble down from the trees every fall?” she asked.